Mystery writer Craig Rice's (aka Georgiana Ann Randolph Rice) sleuthing attorney John J. Malone was for a time a popular character in popular culture. He was the subject of several books and short stories and a hero on radio, television and in the movies. 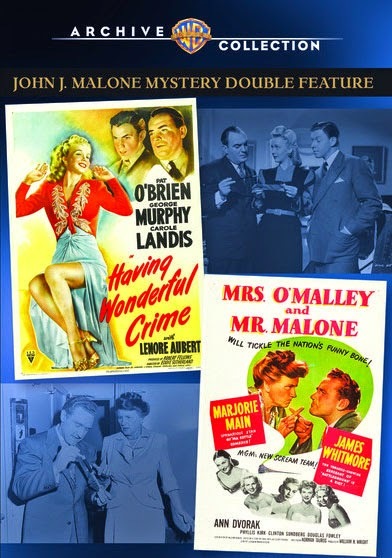 Now two movies featuring Malone, Having a Wonderful Crime (1944) and Mrs. O'Malley and Mr. Malone (1950) are available on a new double feature disc from Warner Archive. A while back I reviewed Crime on My Hands, which was ghostwritten by Rice for actor George Sanders. I loved the humor and wit of the characters so much, that I was eager to see how her work would translate to film. As it turns out, there actually isn't much of Rice in the films beyond her famous characters, Mrs. O'Malley was based on a story by the author and Crime used only her characters. Still, these lighthearted, fast-paced films do capture some of the spirit of this very funny writer. In Having a Wonderful Crime, Pat O'Brien plays Mike (rather than John) Malone. He is a girl-crazy attorney whose newly-married friends Jake (George Murphy) and Helene (Carole Landis) are constantly getting him into trouble. The pair fancy themselves detectives and they are always dragging Malone into their schemes. The trio gets mixed up with a magician, his assistants, a pair of wealthy sisters and a shifty employee at the resort where they are staying. Half the time I didn't understand who was who or what exactly was going on, but it didn't really seem to matter. It was all about the jokes. While the movie is cute and silly, it's never laugh-out-loud funny. Many of the gags fall flat, and Murphy never seems able to keep up with O'Brien and Landis. 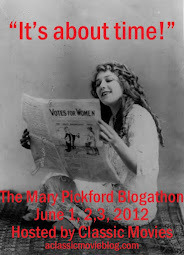 Still, it's well-paced and there's never a dull moment. I'm always delighted to see Landis. She doesn't quite have a knack for this kind of fast-paced, farcical comedy, but there's something exciting about her that makes comic chops almost beside the point. She had presence, and it would have been fascinating to see her develop that charm and beauty into a more well-rounded screen persona. Sadly, within a few years she would commit suicide at the age of 29. 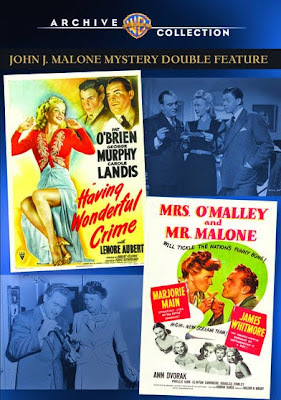 Mrs. O'Malley and Mr. Malone is the more consistently funny movie of the two, mostly due to the chemistry between Marjorie Main, as a sharp-witted widow and James Whitmore, who plays Malone. The pair find themselves attempting to solve a murder together on a train, where someone is trying to frame Malone. Whitmore's Malone is a total lech, contrasted with O'Brien's more playful take on the womanizing lawyer. It's actually a little creepy the way he goes after the ladies. His secretary spends more time smacking him away that actually doing any work. Still, he's got a weird sort of charm, perhaps because he keeps getting away things that he shouldn't and you can't help admiring him for his survival skills. On of the best parts of the film is the snappy supporting cast, with welcome turns by Ann Dvorak, the beautifully chrome-domed Fred Clark and an almost unrecognizable Dorothy Malone as a platinum blonde southern belle. I also liked Phyllis Kirk in the secretary role and wished she had a larger part. Her clever, resourceful character would have been fun in a movie of her own. Though Main and Whitmore don't even meet until the movie is half over, their partnership dominates the film. It's an unusual pairing: there's no sexual tension between them, they have very little conflict because O'Malley idolizes Malone, and they never seem overly fazed by anything, be it a dead body or being arrested for murder. The two quickly settle into an easy rhythm with each other and it's a lot of fun to watch. Both films are easy-going and amusing. Perfect for a quick pick-me-up or rainy afternoon viewing.